Tri Valley Inn and Suites is such a homey and charming accommodation, it has become known as one of the best choices for extended stay hotels in the Pleasanton, California area. To simply enjoy everything that the Tri Valley and nearby San Francisco Bay Area have to offer. 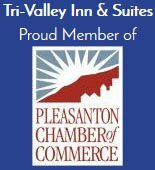 Interested in learning more about our Pleasanton extended stay offers and weekly rate specials? The Tri Valley Inn and Suites management office will be happy to assist you.